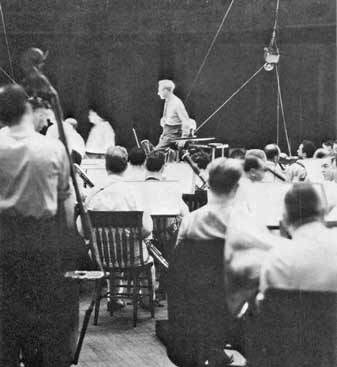 Stokowski and the Philadelphia Orchestra Recording, in the Academy of Music, probably in late 1936. Note the microphone suspended from wires. 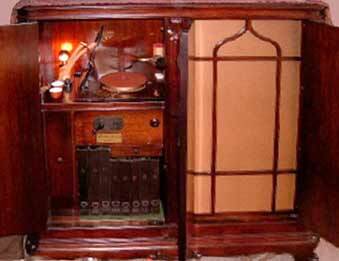 It appears to include the famous Western Electric 394 condenser microphone invented by Edward C. Wente of Bell Laboratories. 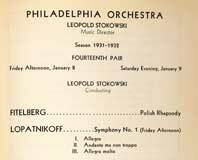 This is a chronological listing of the recordings Stokowski made with the Philadelphia Orchestra during his period as Principal or Co-conductor from 1925 to 1940. This discography is based on the comprehensive, award-winning investigations by John R. Bolig, which he has generously shared. 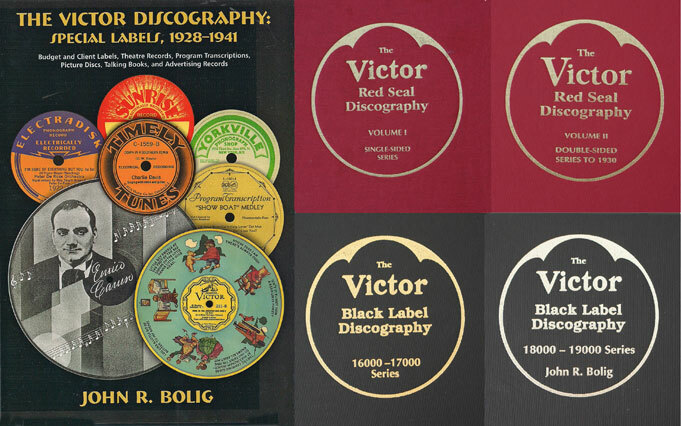 Mr. Bolig was awarded the Association for Recorded Sound Collections 2015 Certificate of Merit for his book: The Victor Discography: Special Labels, 1928–1941 published by Mainspring Press 6. 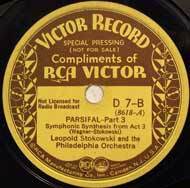 John R Bolig has also published award-winning discographies of Victor Red Seal and Victor Black Seal recordings. 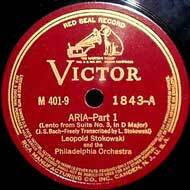 All recordings listed here are Victor Red Seal recordings of the Philadelphia Orchestra conducted by Leopold Stokowski. 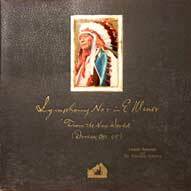 Also included are those experimental recordings of the orchestra made by Bell Laboratories in 1931 and 1932 and restored by Ward Marston for AT&T and issued in 1980. 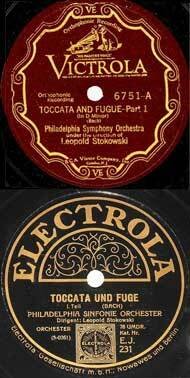 You can read about these Bell Telephone recordings by clicking on Leopold Stokowski, Dr. Harvey Fletcher and the Bell Laboratories Experimental Recordings. 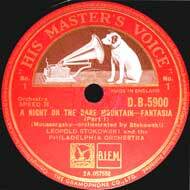 Also not included are the 1939 recordings the Philadelphia Orchestra did for Walt Disney"s film Fantasia. 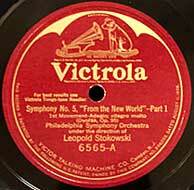 Leopold Stokowski Chronological Discography 1941-1959 by clicking here . 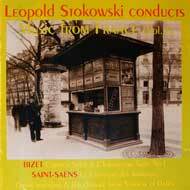 Leopold Stokowski Chronological Discography 1960-1977 by clicking here . 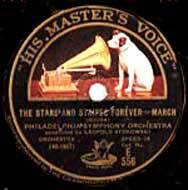 In September, 1931, RCA Victor introduced a series on 12 inch (30 cm) discs recorded at 33 1/3 RPM that they named Program Transcription records. These records were able to contain up to 15 minutes of recording on each side on special equipment, but the experiment was not a commercial success and was phased our beginning in late 1934. 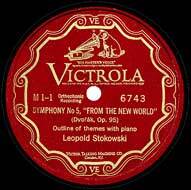 To read more of these 'Program Transcription' recordings and consult a discography, please click on Victor Program Transcription Long Playing Records . 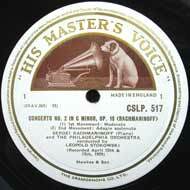 Links in the Table: at the right are two links: "Page" and "MP3". 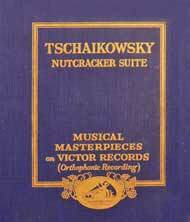 Clicking "Page" will take you to the page in this www.stokowski.org site which discusses the recording. Clicking on MP3 will cause an MP3 version of the recording to download to your computer. Of course, when you click on the word "MP3" to download the music, it will take a longer time to download the large files, and a shorter time for the smaller files. The exact time will depend on the speed of your internet connection, but may take several seconds or even several minutes. 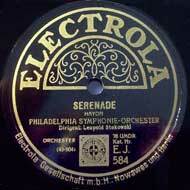 At the time of writing, not all music has been transcribed from 78 RPM disks and encoded in mp3 files. If there is no link "MP3" shown, this means there is not yet a music file available. 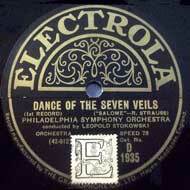 This Serial Number appeared on the HMV DA (10 inch) and DB (12 inch) series records as well as certain other series labels, and is listed in the discography below. 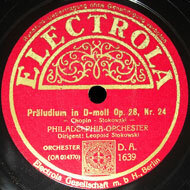 The Matrix Number was pressed into the run-out groove of the record during pressing. 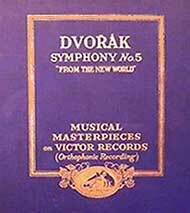 December 8,1925 Victor studio, Building no 15 Camden, NJ USA 1 Antonin Dvorak Symphony no 9 in e minor opus 95 "From the New World"
Confusingly, these same 1925 catalogue numbers were used for the 1927 "New World" symphony recording. 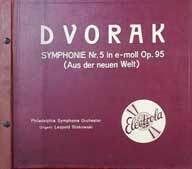 Also, this same 1925 matrix number series was also assigned to the October 1927 re-recording of the Dvorak Symphony no 9, but with different take numbers. 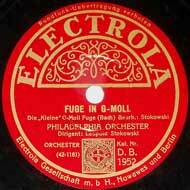 This recording was not issued. 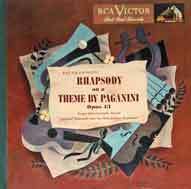 See the October 3, 4, 1927 recording of this work. 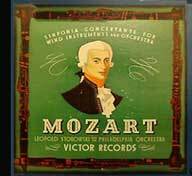 Mark Obert-Thorn has made a fine restorations these recordings for Pristine Classical on PASC500. 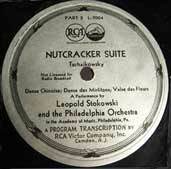 Tchaikovsky: The Nutcracker: In 1931, Victor also dubbed this recording onto a Victor 33 1/3 RPM 12 inch (30 cm) double sided long play "Program Transcription" recording Victor L-7004 for Victor's new long-playing commercial introduction - eventually unsuccessful. Victor L-7004 side A 33 1/3 RPM matrix LCVE-69730-2 contained dubbed 78 RPM matrices CVE 36655-4, CVE 36656-4, CVE 36657-2 and Victor L-7004 side A 33 1/3 RPM matrix LCVE-69764-1 contained dubbed 78 RPM matrices CVE 36669-1, CVE 36670-4, CVE 36671-2. 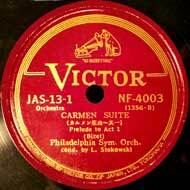 Carmen - Act 1 scene 5 - "Habanera"
Bizet: Carmen: In 1931 these March 10, 1927 Carmen excerpts, plus the April 30 and May 2, 1927 Carmen recordings were dubbed onto L-1000, a Victor 33 1/3 RPM 10 inch (25 cm) double sided long play "Program Transcription" disc, one of the first releases in the Victor long-playing record programme - eventually unsuccessful. 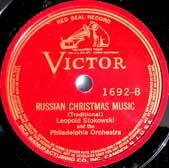 Victor L-1000 side A matrix LBVE-69-165-1 contained 78 RPM matrix BVE 22812-5 (Prelude) and CVE-27903-2 (Changing of the Guard) and CVE-37498-1 (Gypsy Dance). 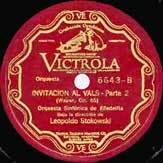 Victor L-1000 side B matrix LBVE-69166-1 contained 78 RPM matrices CVE-37494-2 (intermezzo), CVE-27902-2 (Smugglers) and concluded with BVE-38211-1 (Habanera). 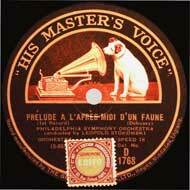 March 10, 1927 Academy of Music, Philadelphia, USA Claude Debussy "Prélude à l'après-midi d'un faune"
Mark Obert-Thorn has made a fine restoration this recording for Pristine Classical on PASC483. 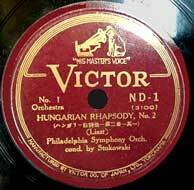 Victor Japan JE-204 with 1927 "Rosamunde"
Academy of Music, Philadelphia, USA Igor Stravinsky Le Sacre du Printemps not issued. 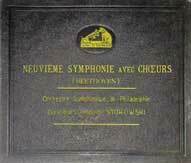 This first trial recording of Le Sacre du Printemps was followed two years later by the successful recordings of 24 September 1929 and 12 March 1930. 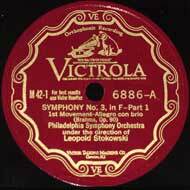 Brahms: Symphony no 1: In 1933, Victor also dubbed this symphony onto three Victor 33 1/3 RPM 12 inch (30 cm) double sided long play "Program Transcription" discs Victor L-11647 through L-11649 in album LM-15 for Victor's long-playing record programme - eventually unsuccessful. 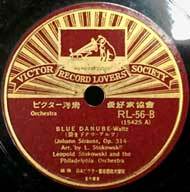 Victor L-11647 side A matrix LCS-76273-1 contained dubbed 78 RPM CVE 37483-2, CVE 37484-2 and side B matrix LCS-76274-1 contained dubbed 78 RPM CVE 37485-2, CVE 37486-1. 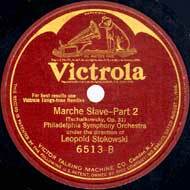 Victor L-11648 side A matrix LCS-76275-2 contained dubbed 78 RPM CVE 37487-2, CVE 37488-2, and side B matrix LCS-76276-1 contained dubbed 78 RPM CVE 37489-1, CVE 37490-2. Victor L-11649 side A matrix LCS-76277-1 contained dubbed 78 RPM CVE 37491-1, CVE 37492-2 with the final 33 1/3 RPM side blank. 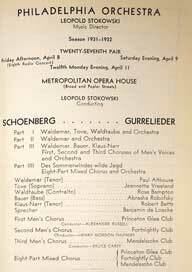 April 30, 1927 Academy of Music, Philadelphia, USA Franz Schubert Symphony no 8 in b minor "Unfinished"
the 1931 "Program Transcription" 33 1/3 dub of the 1927 "Unfinished"
Schubert: Symphony no 8: In 1933, Victor also dubbed this symphony onto two Victor 33 1/3 RPM 12 inch (30 cm) double sided long play "Program Transcription" discs Victor L-11645 and Victor L-11646 for Victor's long-playing record programme - eventually unsuccessful. 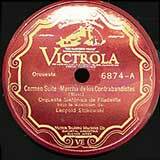 Victor L-11645 side A matrix LCS-75661-3 contained dubbed 78 RPM CVE 29052-6, CVE 29053-6, CVE 29054-6 and side B matrix LCS-75662-4 contained dubbed 78 RPM CVE 29054-6. Victor L-11646 side A LCS-75663-2 matrix contained dubbed 78 RPM CVE 29055-6, CVE 29056-7, CVE 29057-7 with the final 33 1/3 side blank. 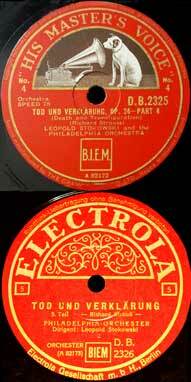 These sides were also issued by Victor in an automatic changer sequence on 33 1/3 "Program Transcription" discs L-11645 and L-11646 with side B blank. 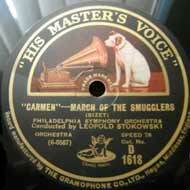 Bizet: Carmen excerpts: In August 1931 for the launch of its (eventually unsuccessful) "Program Transcription" discs, Victor dubbed excerpts from Carmen originally recorded March 10, April 30, May 2, 1927 onto a Victor L-1000 double sided 10 inch (25 cm) 33 1/3 RPM disc. The Victor L-1000 side A 33 1/3 matrix LBVE-69-165-1 contained 78 RPM matrices BVE 22812-5 (Prelude) with CVE-27903-2 (Changing of the Guard) and CVE-37498-1 (Gypsy Dance). The Victor L-1000 side B 33 1/3 RPM matrix LBVE-69166-1 contained 78 RPM matrices CVE-37494-2 (intermezzo), CVE-27902-2 (Smugglers) and concluded with BVE-38211-1 (Habanera). 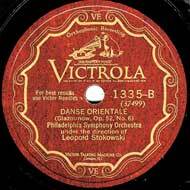 May 2, 1927 Academy of Music, Philadelphia, USA Alexander Glazunov Scènes de ballet opus 52 (1894) - "Danse orientale"
May 3, 1927 Academy of Music, Philadelphia, USA Nicolai Rimsky-Korsakov Scheherazade opus 35 This recording was not issued. 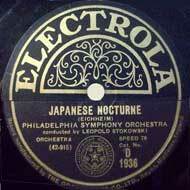 See the October 8, 10, 11, 1927 recording. 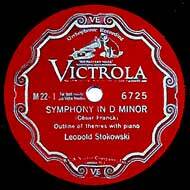 Franck: Symphony in D minor: In 1933, Victor also dubbed this recording onto three Victor 33 1/3 RPM 12 inch (30 cm) double sided long play "Program Transcription" discs Victor L-11650, Victor L-11651 and Victor L-11652 for Victor's long-playing record programme - eventually unsuccessful. Victor L-11650 33 1/3 side A matrix LCS-76268-2 contained dubbed 78 RPM CVE 34730-3, CVE 34731-4. 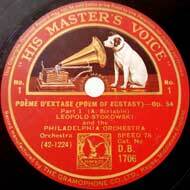 Side B matrix LCS-76274-1 contained dubbed 78 RPM CVE 34732-3, CVE 34733-3. Victor L-11651 side A matrix LCS-76270-1 contained dubbed 39340-2, CVE 39341-1 and side B matrix LCS-76271-1 contained dubbed 78 RPM CVE 39342-1, CVE 39343-1. Victor L-11652 33 1/3 side A matrix LCS-76272-1 contained dubbed 78 RPM CVE 39344-1, CVE 39345-1 with the final 33 1/3 side being blank. It was also issued on three Victor "Program Transcription" discs in automatic changer sequence L-11723 through L-11725 with side B blank. 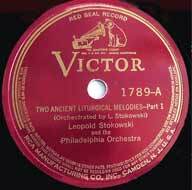 Academy of Music, Philadelphia, USA Antonin Dvorak Symphony no 9 in e minor opus 95 "From the New World"
Victor Argentina release of "Rosamunde" Victor 1312 coupled with 1927 Schubert "Moment Musical"
recall that a 12 inch (30 cm) recording of this work including repeats was made on 2 May 1927 but not released. 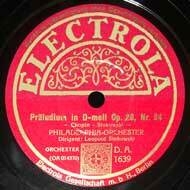 Mark Obert-Thorn has made a fine restoration this recording for Pristine Classical on PASC483 which also includes the longer 2 May 1927 version. Victor Japan JE-204 with 1927 "Moment Musicale"
Victor Japan NF-4054 with 1927 "Moment Musicale"
Stokowski concludes his performance of the Romeo and Juliet Fantasy Overture with the fermata prior to the usual last 4 bars, cuts these last 4 bars and adds an additional, gentle chord an octave lower than the fermata chord, to make a quiet revised ending - which he did throughout his career. Victor 6995, 6996, 6997 A in M-46 coupled with the 1928 de Falla "Danse Espagnole"
DB 1947 through DB 1949 with de Falla "Danse Espagnole"
D 1708, D 1709, D 1710 with 1929 "Wir glauben all an einen Gott"
EJ 504, EJ 505, EJ 506 A (Electrola Germany) with 1929 "Wir glauben all an einen Gott"
December 8, 1928 Academy of Music, Philadelphia, USA Manuel de Falla La Vida Breve - Danse espagnole Victor 6997 in Victor M-46 coupled with 1928 "Romeo and Juliet"
DB 1949 coupled with 1928 "Romeo and Juliet"
Victor L-7002 33 1/3 side A matrix LCVE-69777-1 Russian Easter Overture contained dubbed 78 RPM matrices CVE-48923-1, CVE-48924-3A, CVE-48925-2A, CVE-48926-1. 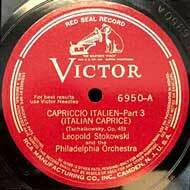 Victor L-7002 33 1/3 side B matrix LCVE-69778-1 Capriccio italien contained dubbed 78 RPM matrices CVE 48932-1, CVE 48933-2, CVE 48934-3, CVE 48935-2.
serial nos. 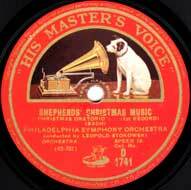 42-600 through 42-609, 2-05742 through 2-05745, 2-08056 through 2-08059.
labeled by Stokowski "Shepherd's Christmas Music"
May 2, 1929 (also unsuccessful September 27, 1928 session) Academy of Music, Philadelphia, USA Claude Debussy Nocturnes: no 1 - Nuages (Clouds) Victor 7453 in album M-116 coupled with 1931 Debussy "Danses Sacrée et Profane"
Victor 16570, 16571 with 1929 Thomas Mignon Gavotte and 1931 Debussy "Danses Sacrée et Profane"
Sibelius: Swan of Tuonela: In 1933, Victor also dubbed this recording onto a Victor 33 1/3 RPM 12 inch (30 cm) double sided long play "Program Transcription" disc Victor L-11656 for Victor's long-playing record programme - eventually unsuccessful. 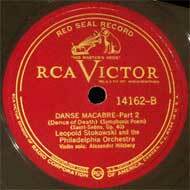 Victor L-11656 33 1/3 side A matrix LCS-76752-1 contained dubbed 78 RPM CVE 47973-2, and dubbed 78 RPM matrix CVE 47980-3. 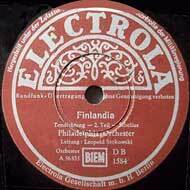 Side B of the disc contained the April 1930 recording of Sibelius's Finlandia dubbed to 33 1/3 speed. 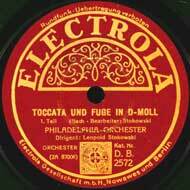 This is the entr'acte music played at the beginning of Act 2. 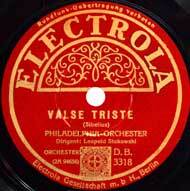 Victor 7456 B in M-116, with 1931 Debussy "Danses sacrée et profane"
US label reads: "18th CENTURY DANCE (Josef Haydn)"
Electrola Germany EJ 584 Victor 7256 B coupled with with Boccherini Minuetto. 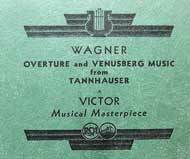 Wagner: Tannhäuser: In August 1933, Victor also dubbed this recording onto two Victor 33 1/3 RPM 12 inch (30 cm) double sided long play "Program Transcription" discs Victor L-11669 and L-11670 for Victor's long-playing record programme - eventually unsuccessful. Victor L-11669 33 1/3 side A matrix LCS-76754-1 contained dubbed 78 RPM CVE 51876-6 and dubbed 78 RPM matrix CVE 51877-5A. 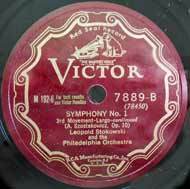 Side B matrix LCS-76755-1 contained dubbed 78 RPM matrices 51878-2 and CVE 51879-4A. Victor L-11670 33 1/3 side A matrix LCS-76756-1 contained dubbed 78 RPM matrices CVE 51880-1A and CVE 51875-2, with side B blank. 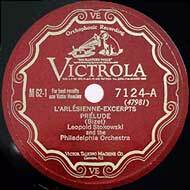 An automatic sequence "Program Transcription" album contained Victor L-11747 and L-11748. Mark Obert-Thorn in his fascinating Pristine Classical album PASC422 has shown matrix pair CVE-51883-2/2A to have been fed by different microphones, therefore giving an "accidental stereo" image when stabilized by the Capstan pitch-stabilizing program and careful phase allignment - a technical tour-de-force by Mark Obert-Thorn. 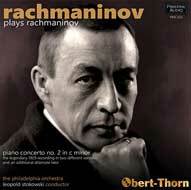 Visit Pristine Classical for fascinating recordings. Victor 7200, 7201, 7202-A in M-71 coupled with 1928 Tchaikovsky Song without Words on final B side. 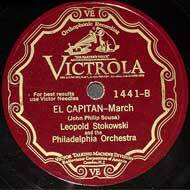 March 15, 1930 for BVE-51886-5A Academy of Music, Philadelphia, USA John Philip Sousa March "El capitán"
September 27, 1929 Academy of Music, Philadelphia, USA John Philip Sousa March "Manhattan Beach" not issued as a 78 RPM record. 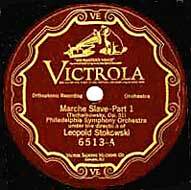 September 27, 1929 Academy of Music, Philadelphia, USA John Philip Sousa March "Stars and Stripes Forever"
Sibelius: Finlandia: In 1933, Victor also dubbed this recording onto a Victor 33 1/3 RPM 12 inch (30 cm) double sided long play "Program Transcription" disc Victor L-11656 for Victor's long-playing record programme - eventually unsuccessful. Victor L-11656 33 1/3 side B matrix LCS-76753-1 contained dubbed 78 RPM CVE 56834-2A, and dubbed 78 RPM matrix CVE 56835-3A. 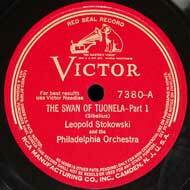 Side B of the disc contained the May 1929 recording of Sibelius's Swan of Tuonela dubbed to 33 1/3 speed. 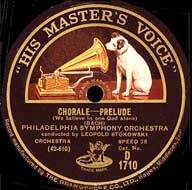 April 30, 1930 Academy of Music, Philadelphia, USA Claude Debussy Préludes I, no 10 - "La cathédrale engloutie"
last regular recording in the Academy of Music until 25 November 1935 with full orchestra of 96 musicians: 36 violins, 12 violas, 10 basses, 4 oboes, 4 bassoons, 5 clarinets, 4 flutes, 3 trumpets, 4 trombones, 8 horns, 1 tuba, 2 harps, 2 percussion, and tympani Victor 7454 in M-116 with 1931 "Danses sacrée et profane"
the test recordings of March 17, 1931 were made on matrices CVE-1269-1 and CVE-1270-1 Camden Church Studio 1, Camden, NJ USA Claude Debussy "Danses sacrée et profane"
recorded directly onto 33 1/3 RPM Victor "Program Transcription" matrices for Victor's new long-playing commercial introduction - eventually unsuccessful. 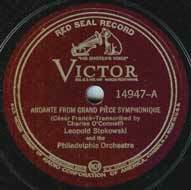 The only 1931 Philadelphia Orchestra Victor recording in the Academy of Music. 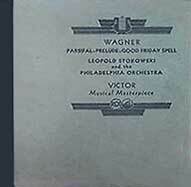 Wagner Concerts of 15, 16, 18 January 1932: The Philadelphia Orchestra concerts of 15, 16, 18 January 1932 were performed in the larger Metropolitan Opera House, North Broad Street, Philadelphia and broadcast by CBS radio. 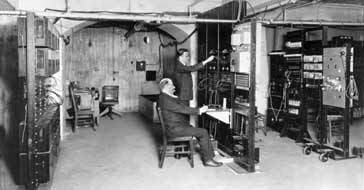 Sponsors paid for the broadcast equipment to be installed in the Opera House, and it may be that the Bell Telephone experimental recordings were either taken from the radio feed or from independent Bell Telephone equipment. 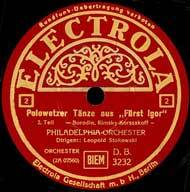 conducted not by Stokowski, but by Fritz Reiner and included here as part of the Bell Labs experimental recordings listing. parts of individual movements recorded live by Bell Laboratories engineers but not released until Ward Marston restorations. Exciting performances. 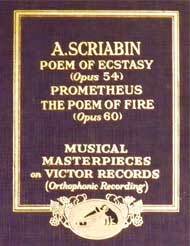 restored by Ward Marston and included in the 2 CD set 52073-2 "Landmarks of Recorded Pianism, Volume 1"
Scriabin: Poem of Extasy, Poem of Fire: At the same time as the 78 RPM Scriabin recordings, they were also recorded directly onto two 12 inch (30 cm) 33 1/3 RPM Victor "Program Transcription" discs in Victor album LM-125: Victor L-11616 (Extasy) and L-11617 (Fire). 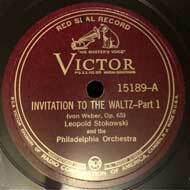 This 33 1/3 RPM album was released by Victor in June, 1932 at the height of the great depression. L-11616 (Extasy) used 33 1/3 matrix LCSHQ-72019-1 for side A, 33 1/3 matrix LCSHQ-72022-1 side B. L-11617 (Fire) used 33 1/3 matrix LCSHQ-72025-1 for side A, 33 1/3 matrix LCSHQ-72028-1 side B.
Victor recorded seven 12 inch (30 cm) 33 1/3 RPM "Program Transcription" discs: L-11609 through L-11615 in Victor album LM-127 consisting of 13 sides of the Gurre-Lieder and one side of Stokowski's explanation of Gurre-Lieder themes. 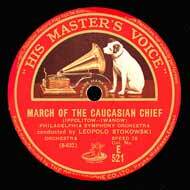 33 1/3 RPM matrices: LCSHQ-71699-1 through LCSHQ-71711-1. sides were faded out and faded in on two separate cutting machines. 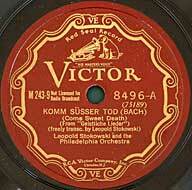 this first recording of Gurre-Lieder remains one of the finest after more than 85 years Fourteen Victor 12 inch (30 cm) 78 RPM discs: Victor 7524 through 7537 in album M-127 consisiting of 27 sides of Gurre-Lieder music and one side of Stokowski's explanation of Gurre-Lieder themes. 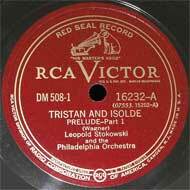 Tristan und Isolde - Symphonic Synthesis: At the same recording session, this performance was recorded onto two 12 inch (30 cm) 33 1/3 RPM Victor "Program Transcription" L-11636, L-11637 in album LM-154. L-11636 side A used 33 1/3 matrix LSCHQ-72064-1, side B used 33 1/3 LSCHQ-72067-1. L-11637 side A used 33 1/3 matrix LSCHQ-72070-1, side B used 33 1/3 matrix LSCHQ-72072-1. 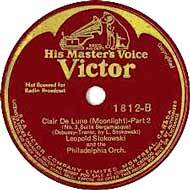 The recording was also mastered onto automatic changer 33 1/3 RPM sequence on Victor "Program Transcription" discs L-11711, L-11712. 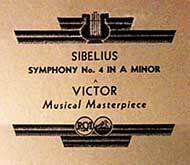 Sibelius: Symphony no 4: At the same recording session, this performance was recorded onto two 12 inch (30 cm) 33 1/3 RPM Victor "Program Transcription" L-11638, L-11639 in album LM-160. L-11638 side A used 33 1/3 matrix LSCHQ-72078-1, side B used 33 1/3 matrix LSCHQ-72081-1. L-11639 side A used 33 1/3 matrix LSCHQ-72084-1, side B used 33 1/3 matrix LSCHQ-72087-1. 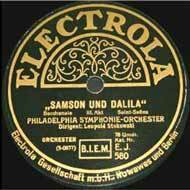 recorded live by Bell Laboratories engineers but not released until Ward Marston restorations. 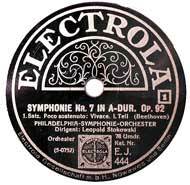 April 30, 1932 Camden Church Studio 2, Camden, NJ USA Arnold Schoenberg Gurre-Lieder (1911) - Long description of themes by Stokowski with Sylvan Levin, piano Victor 12 inch (30 cm) 33 1/3 RPM "Program Transcription" for Victor's new long-playing commercial programme. 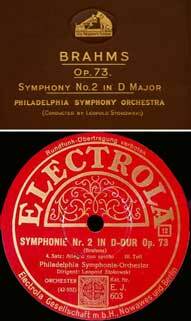 The Philadelphia Orchestra concert pair of December 9, 10, 1932 including Dubensky's The Raven was recorded live onto a film soundtrack using the RCA Photophone system, then dubbed onto FRC matrices FRC-74824-1 through FRC-74837-1. On 10 February 1933 these The Raven FRC matrices FRC 74832 and FRC 74833 were transferred onto 10 inch (25 cm) 78 RPM matrices BS-69483-2, BS-69484-3, BS-69485-2, BS-69486-2. 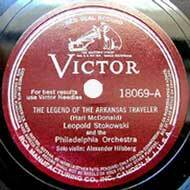 Victor 78 RPM 10 inch (25 cm) L-2000, L-2001 laminated Picture Disks commercialized in April 1933.
picture disc matrices BS 69483-2, BS 69484-3, BS 69485-2, BS 69486-2. 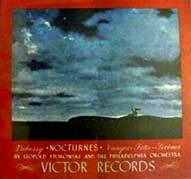 Debussy: Nocturnes (1899) - "Nuages", "Fêtes"
unidentified: "Painting of Landscape; Melody of People"
Philadelphia Orchestra concert of 9 December 1932 Not released: The Philadelphia Orchestra concert pair of December 9, 10, 1932 was recorded live onto a film soundtrack using the RCA Photophone system, then dubbed onto fourteen FRC matrices FRC-74824-1 through FRC-74837-1. 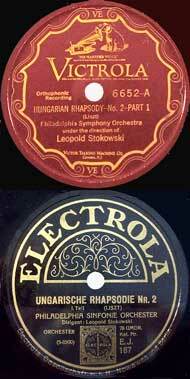 In February 1933, some of these were FRC matrices were dubbed onto 10 inch (25 cm) 78 RPM matrices, although not released. The Macdowell suite matrices FRC-74824, FRC-74825, FRC-74831 and FRC-74832 were dubbed onto BS-75603 and BS-75604. 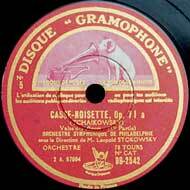 Debussy: Nocturnes (1899): "Nuages" FRC-74827 and "Fêtes" FRC-74828 not dubbed. 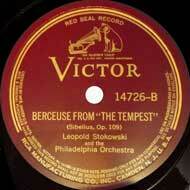 Sibelius "The Tempest" movement matrix FRC-74834 and FRC-74835 dubbed onto BS-75605. Sibelius Finlandia matrix FRC-74828, FRC-74829, FRC-74836 not dubbed. 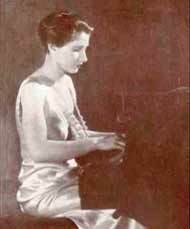 Eunice Norton in 1932 the Philadelphia Orchestra concert pair of December 16, 17, 1932 was recorded live onto RCA Photofilm soundtracks FRC-74868-1 and FRC-74869-1. 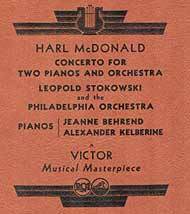 The Philadelphia Orchestra concert pair of December 16, 17, 1932 was recorded live onto a film soundtrack using the RCA Photophone system. 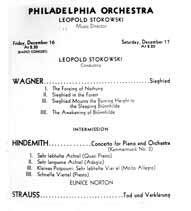 These concerts included Stokowski's "Symphonic Synthesis" from Wagner's Siegfried, and the Strauss Tod und Verklärung. 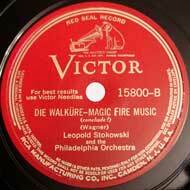 (Theses recordings were not released by Victor) In February and March 1933 the Siegfried Synthesis music from Photophone matrices FRC-74865-1, FRC-74866-1, FRC-74867-1 was dubbed onto 12 inch (30 cm) 78 RPM matrices CS-69487-1, CS-78152-2, CS-75153-2, CS-75190-3, CS-75191-2, CS-75192-2, although not released. 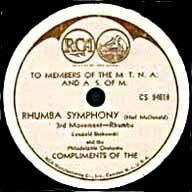 The music from Act 1 Scene 3 "the forging of Nothung" which begins the Synthesis was separately dubbed on 31 January 1933 directly from film to a 10 inch (25 cm) 78 RPM matrix BS-69487-1, not issued. 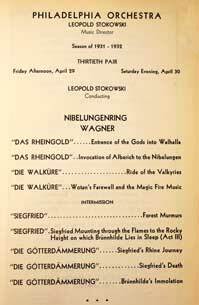 Part 1 of the Synthesis: the Prelude, Alberich with the Rhinemaidens, the descent of Wotan and Loge into Nibelheim, Erda's warning. 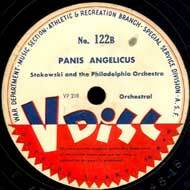 Part 2 "Entrance of the Gods into Valhalla" as arranged by Stokowski. 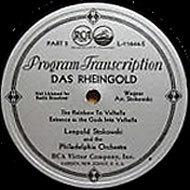 "Program Transcription" 33 1/3 RPM recording in album LM-179 Das Rheingold - Symphonic Synthesis: At the same time as the 78 RPM Rheingold recording, this was also recorded directly onto two 12 inch (30 cm) 33 1/3 RPM Victor "Program Transcription" discs in album LM-179. The discs were Victor L-11643, L-11644. L-11643 side A used 33 1/3 matrix LSC-75179-2, side B used 33 1/3 matrix LSC-75182-2. L-11644 side A used 33 1/3 matrix LSC-75185-1, with side B blank. 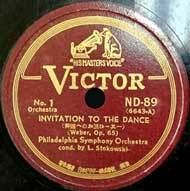 It was also mastered onto automatic changer 33 1/3 sequence on Victor "Program Transcription" discs L-11716, L-11717. 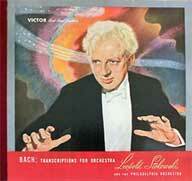 Brahms: Symphony no 4: At the same recording session, this performance was recorded onto three 12 inch (30 cm) 33 1/3 RPM Victor "Program Transcription" discs L-11653, L-11654, L-11655 in album LM-185, but not released. L-11653 side A used 33 1/3 matrix LSC-75164-1, side B used 33 1/3 matrix LSC-75166-2. L-11654 side A used 33 1/3 matrix LSC-75170-1, side B used 33 1/3 matrix LSC-75173-1. L-11655 side A used 33 1/3 matrix LSC-75176-2, with side B blank. They were not released. 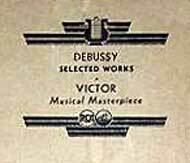 The recording was also mastered onto automatic changer 33 1/3 RPM sequence on Victor "Program Transcription" discs L-11736, L-11737, L-11738. They were not released. 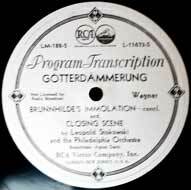 Die Götterdämmerung: The conclusion of this recording, Siegfried's Death parts 1, 2, and 3, and Brünnhilde's Immolation scene, were recorded onto a film soundtrack using the RCA Photophone system: film masters F 75634, F 75678 and F 75681. 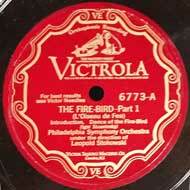 The source of the 33 1/3 RPM Victor "Program Transcription" matrices is reported differently. 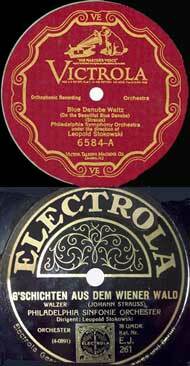 On 9 and 20 June 1933, the Photophone film masters were dubbed onto 33 1/3 RPM Victor "Program Transcription" matrices making up the last three 33 1/3 RPM album sides: L-11672 sides A and B, and L-11673 side A (side B blank); supported by Library of Congress data. These dubbed 33 1/3 matrices were LCS-75634-3, LCS-75681-1 and LCS-75678-2. 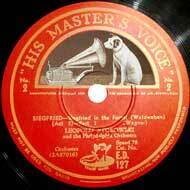 Hoiwever, the Discography of American Historical Recording 3 states that for 33 1/3 matrix LCS-75634 "...Takes 3 and 4 are noted in Victor ledgers as dubs 'from 35mm film to 33 1/3-rpm disc.' 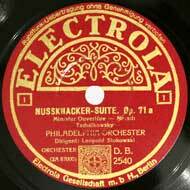 ADP editors believe this is may be an error, and instead they are 78-rpm disc to 33 1/3-rpm disc transfers." 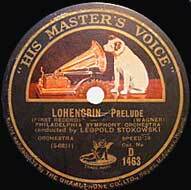 In any case, 33 1/3 matrices LCS-75628-1 and LCS-75631-1 used for the first two sides of the long play album L-11671 were dubbed from the 78 RPM master matrices, and the remaining three sides: album L-11672 sides A and B, and L-11673 seem to have used the RCA Photophone film masters as their source, according to the Library of Congress data. 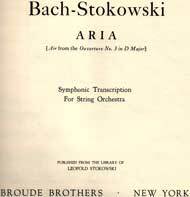 Stokowski's excerpts consisted of Act 1 'Spring Song' of Sigmund, Act 3 Ride of the Valkyries, Act 3 Wotan's Farewell and Fire Music. 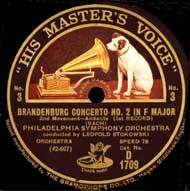 The 78 RPM and 33 1/3 RPM recordings were not released. 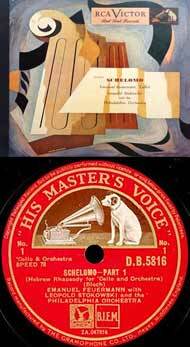 These excerpts were recorded simultaneously on 78 RPM matrices and 33 1/3 "Program Transcription" matrices, using multiple cutting machines fading from one matrix to the next without stops. 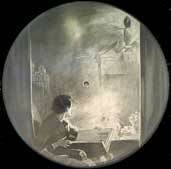 two 33 1/3 "Program Transcription" discs L-11674, L-11675 matrices: LCS-74587-1 to LCS-74590-1 not released. 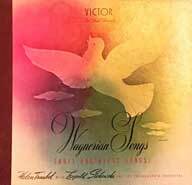 Victor also prepared this recording on 33 1/3 "Program Transcription" discs in automatic changer sequence discs l-11739, L-11740 also not released. 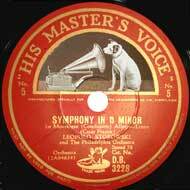 The 78 RPM and 33 1/3 RPM recordings were not released. 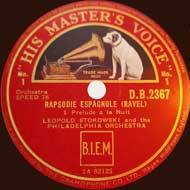 As with Die Walküre, above, this Rapsodie espagnole was recorded simultaneously on 78 RPM matrices and 33 1/3 "Program Transcription" matrices, with multiple cutting machines using 'fade out, fade in'. 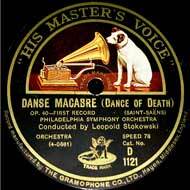 The 78 RPM and 33 1/3 RPM recordings were not released. 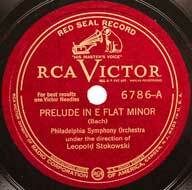 The 78 RPM recordings were not released. Recorded simultaneously on 78 RPM matrices and 33 1/3 "Program Transcription" matrices, with multiple cutting machines using 'fade out, fade in'. 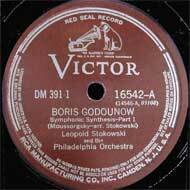 When these Liadov transcriptions were successfully recorded on 17 March 1934, it was released on one 12 inch (30 cm) and one 10 inch (25 cm) Victor Red Seal record rather than the all 12 inch matrices of this session. 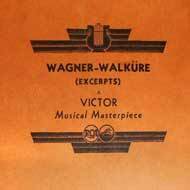 This 28 October 1933 recording was also prepared for Victor's ultimately unsuccessful 33 1/3 "Program Transcription" programme. 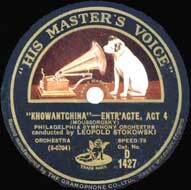 The 78 RPM recordings were not released, but the 33 1/3 "Program Transcription" matrices were used for the later November 1934 release. 33 1/3 "Program Transcription" matrices: LCS-78439-1 and LCS-78442-1. 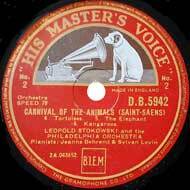 HMV album 8695 through DB 8699 As with the October 1933 sessions, this was recorded simultaneously on 78 RPM matrices and 33 1/3 "Program Transcription" matrices, with multiple cutting machines using 'fade out, fade in'. 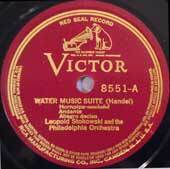 Victor 7884 through 7888 later coupled with 1935 Shostakovich Prelude opus 34 no 14 in album M-192. 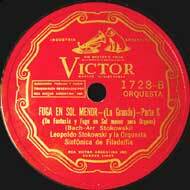 also Victor 7884 through 7893 in album AM-192. also Victor 16601 through 16605 in album DM-192. 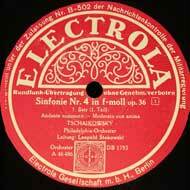 DB 3847 through DB 3851 with 1928 Tchaikovsky "Song without Words"
note on Shostakovich: Symphony no 1 matrices: The last two matrices of this recording session, 78455-1, 78456-1 were damaged, and rather than a new recording, Victor dubbed the 33 1/3 RPM matrix LCS-78457-1 onto one 78 RPM matrix CS-78949-4 which became side A of disc 7888, with side B blank. 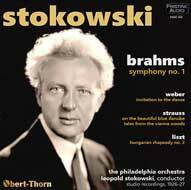 In later years, the 30 December 1935 Philadelphia recording of the Stokowski orchestration of the Shostakovich Prelude opus 34 no 14 in e flat minor was added to the M-192 Album as side 10. 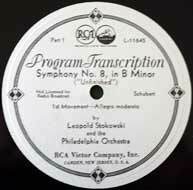 Shostakovich: Symphony no 1: At the same recording session, this performance was recorded on three 33 1/3 "Program Transcription" discs: L-11744, L-11745 and L-11746. L-11744 side A used 33 1/3 RPM matrix LCS-78445-1 and side B used 33 1/3 RPM matrix LCS-78454-1. L-11745 side A used 33 1/3 RPM matrix LCS-78448-1 and side B used 33 1/3 RPM matrix LCS-78457-1. L-11746 side A used 33 1/3 RPM matrix LCS-78451-1, and side B was blank. 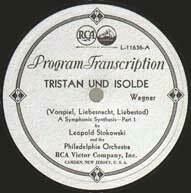 A 33 1/3 "Program Transcription" album in automatic changer format was released on 3 discs: L-11749, L-11750, L-11751 with side B blank. 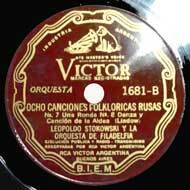 Victor Argentina release of Liadov "Ocho Canciones Folkloricas Rusas" These Liadov Songs were recorded on 78 RPM matrices during the March 17, 1934 session and on 33 1/3 "Program Transcription" matrices during the November 18, 1933 session. Multiple cutting machines were used so that sides could be faded from one matrix to the next without the orchestra stopping between takes. 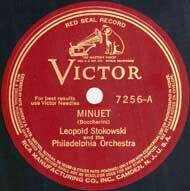 The 78 RPM recordings were released on one 12 inch (30 cm) Victor Red Seal disc 8491 and one 10 inch (25 cm) disc 1681. 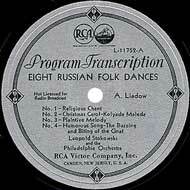 Liadov: Eight Russian Folk Songs: These Liadov Songs were recorded on two 33 1/3 RPM matrices during the November 18, 1933 session and issued on a Victor "Program Transcription" disc L-11752. HMV and Electrola DB 2324-2326 Victor 8288, 8289, 8290, 8291 in M-217 as originally issued on 4 discs with side 8 blank. 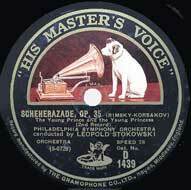 28 October 1933 Adagio from the Toccata, Adagio and Fugue in c major BWV 564 is on the 18th side in the European HMV album. 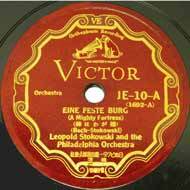 DB 2451 through 2453 with 1933 "Ein feste Burg"
DB 7860 through 7862 automatic sequence with 1933 "Ein feste Burg"
HMV album ED-957 as released in Italy "La Voce del Padrone"
October 22, 1934 Camden Church Studio 2, Camden, NJ USA Antonin Dvorak Symphony no 9 in e minor, opus 95 "From the New World"
October 22, 1934 Camden Church Studio 2, Camden, NJ USA Johann Sebastian Bach St. John's Passion BWV 245: "Es ist vollbracht"
November 12, 1934 Camden Church Studio 2, Camden, NJ USA attributed to Giovanni Pierluigi da Palestrina "Adoramus te, Christe"
the original 1934 10 inch (25 cm) matrix BS 84578-1 was not issued in the USA. Victor dubbed the 10 inch matrix to 12 inch matrix 4 times in 1943-1944.
matrices CS-87001, 87004 and 87005 dubbed February 25, 1943 due to wear. this recording was not released. 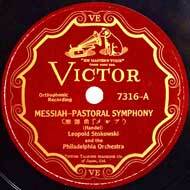 Note that Stokowski recorded his excerpts from Parsifal: Act 3 on April 7, 1934. 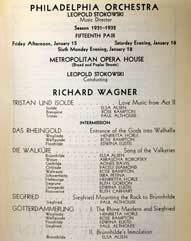 Stokowski used music from Act 1 scene 2 where Wotan, disguised, asks questions of dwarf Mime; then Siegfried's Forging Song; then "Forest Murmurs"; finally to the finale Act 3 on Brünnhilde's rock including Siegfried and Brünnhilde's love duet. 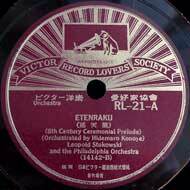 December 16, 1935 Academy of Music, Philadelphia, USA "Etenraku - Japanese Ceremonial Prelude"
Prince Konoye also founded the New Symphony Orchestra of Tokyo, later named the NHK Symphony Orchestra disc labeled "Etenraku 8th Century Japanese Ceremonial Prelude"
Japanese Victor Record Lovers Society RL-21-A issue of "Etenraku" Victor 14142 side B, coupled with the 1934 recording of Henry Eichheim's Oriental Impressions "Bali"
This 1935 selection was Stokowski's second arrangement of excerpts from Act 2. 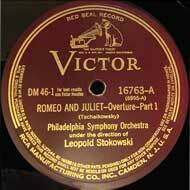 Recall that April 16, 23, 1932 Stokowski recorded excerpts from Act 2 concluding with the Love Music (Liebesnacht). 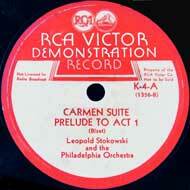 This 1935 arrangement concludes with Act 2 finale. The recording was coupled with the 5 April 1937 Prelude to Act 1 beginning side A Victor M-508. 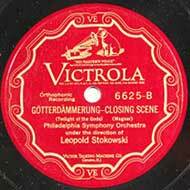 Following criticism, on April 20, 1939 Stokowski re-recorded the ending, substiting the concluding Liebestod. Victor M-508 included this revised side after 1939. Victor 15202 and 15203 A (1937 Prelude to Act 1), 15203 A, 15204, 15205, 15206 in M-508. 15206 B was blank in 1930s, with 1934 Palestrina added after 1943. Victor 15207 A, 15208 A, 15209 A (1937 Prelude to Act 1), 15210, 15211, 15209 B, 15208 B, 15207 B in AM-508. 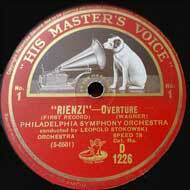 Final side blank in 1930s with 1934 Palestrina added after 1943. 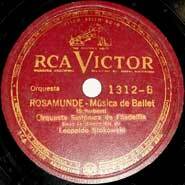 Victor 16232 A, 16233 A, 16234 A (1937 Prelude to Act 1), 16235, 16236, 16234 B, 16233 B, 16232 B in DM-508. 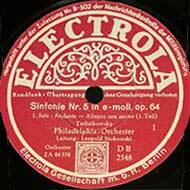 Final side blank in 1930s with 1934 Palestrina added after 1943. 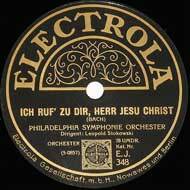 (orchestration by Stokowski of these church choruses) "Veni, creator spiritus" and "Veni Emanuel"
Electrola DA-1639 matrix BS 94649-1 not issued by Victor in the USA. 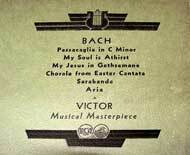 Victor 15313, 15314 A in album M-530 coupled with "Ich ruf' zu Dir, Herr Jesu Christ"
DB 3254, DB 3255 coupled with 1936 Tchaikovsky "Solitude"
DB 6009 coupled with with 1937 Sibelius "The Tempest"
DB 3318 coupled with the 1936 Franck Panis Angelicus. 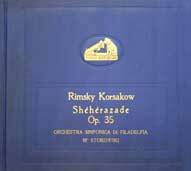 November 16, 1936 Academy of Music, Philadelphia, USA Modest Mussorgsky Boris Godunov (1872) "Synthesis"
Parsifal: Act 3 "Good Friday Spell"
labeled by Stokowski: "My Soul is Athirst"
April 5, 1937 Academy of Music, Philadelphia, USA Johann Sebastian Bach "Jesus Christus, Gottes Sohn" 4th movement of Cantata no 4 ("Christ Lag In Todesbanden") BWV 4. 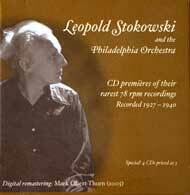 (CD) released in CALA CACD0501 "Stokowski conducts Philadelphia Rarities"
arranged by Victor recording producer Charles O'Connell Victor 14947 A coupled with 1936 "Solitude"
matrices CS 07596-1, CS 07597-1, CS 07598-1, CS 07599-1, CS 07600-1, CS 07601-1. 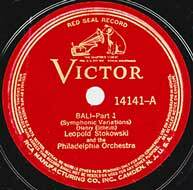 April 19, 1937 Academy of Music, Philadelphia, USA William Byrd (1540-1623) "Pavane", "Gigue"
Victor 15814 in M-630 coupled with 1939 "Fêtes" and "Sirènes"
Victor 17501, 17502 A in album M-717 coupled with 1939 "Ivan the Terrible"
Victor 18462, 18463 in album DM-717 coupled with 1939 "Ivan the Terrible"
DB 6038, DB 6039 with 1939 "Ivan the Terrible"
April 20, 1939 Academy of Music, Philadelphia, USA Claude Debussy Nocturnes (1899) no 2: Fêtes (Festivals) Victor 2034 in album M-630 coupled with 1937 "Nuages" and 1939 "Sirènes"
Victor 11-8577 B in album M-963 (Stokowski's Bach transcriptions) coupled with Bach "Ich ruf' zu dir, Herr Jesu Christ"
April 9, 1939 Academy of Music, Philadelphia, USA Nikolai Rimsky-Korsakov The Maid of Pskov (1873 revised 1898) - Act 3 Prelude - "Hunt and Storm"
no 3: Sirènes with "Women's Chorus"
April 20, 1939 Academy of Music, Philadelphia, USA Richard Wagner Tristan und Isolde - "Liebestod"
The original composition was written by Mussorgsky in 1874 and were his musical impressions of 10 (or perhaps 11) pictures, or tableaux by Mussorgsky's friend Viktor Hartmann (1834–1873), shown at a retrospective exhibition of Hartmann's works. 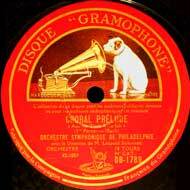 In his original piano composition of 1874, there are ten 'tableaux', linked by 'Promenades'. 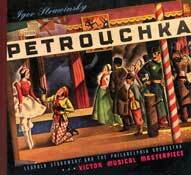 Mussorgsky composed the promenade music to represent an exhibition visitor walking from picture to picture. 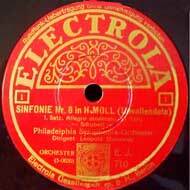 March 27, 1940 Academy of Music, Philadelphia, USA Reinhold Glière Symphony no 3 in b minor - "Ilya Mourometz"
December 8, 1940 Academy of Music, Philadelphia, USA Johann Sebastian Bach "Arioso" - from 1st first movement 'Sinfonia' of Bach's Cantata no 156; also as the Largo movement from Bach;s Concerto for harpsichord and strings BWV 1056. 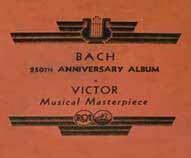 December 8, 1940 Academy of Music, Philadelphia, USA Johann Sebastian Bach Saint John's Passion BWV 245 - no 58 "Es ist Vollbracht"
December 22, 1940 Academy of Music, Philadelphia, USA Ottocar Novacek (Ottokar Nováček) "Perpetuum Mobile" (Perpetual Motion) opus 5 no 4 (as orchestrated Stokowski) Victor 18069 B coupled with the 1940 Harl McDonald "Legend of the Arkansas Traveler"
Leopold Stokowski - All- American Youth Orchestra Discography 1940-1941 . 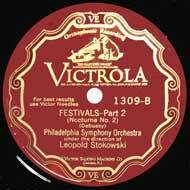 Leopold Stokowski - Discography 1941-1959 . 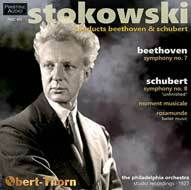 Leopold Stokowski - Discography 1960-1977 . 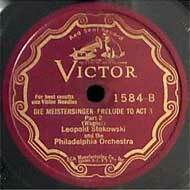 Leopold Stokowski - Philadelphia Orchestra Acoustic Discography . 1. 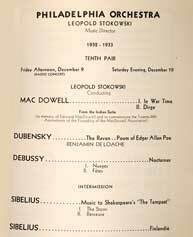 The column to the right labeled "Link" will take you to the page of this stokowski.org site which discusses the recording. Simply click on the word "Page". 2. The column to the right labeled "MP3" gives a link to the file, in mp3 format of the recording. Simply click on the word "MP3" to download and listen to the mp3 file. Also note any MP3 files that are indicated as being large, since they may take some time to download. All the music files linked in the table are in mp3 format (128 mbps). This means that they are of different sizes. 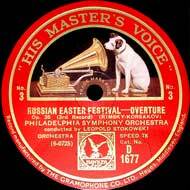 For example, the second file in the list, the April 29, 1925 Borodin ‘Polovetzki Dances’ is small - 3.6MB. 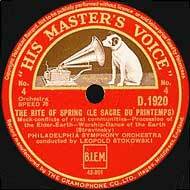 In contrast, the 1929 Le Sacre du Printemps file is large. Part 1 is 14MB and Le Sacre part 2 is 16MB. 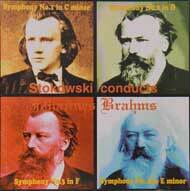 These Musical Masterpiece albums used the album prefix M-, as for example M-253. 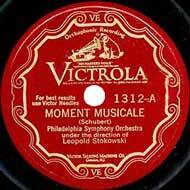 Beginning in 1927, Victor introduced its first automatic record changing players, beginning with the Victrola model VE 10-50 selling for an astronomical US$600.00. Yet an estimated 12,000 model VE 10-50 machines were sold in less than two years, prior to the intrduction of later models 5. The VE 10-50 featured an acoustic process player with an electrically driven mechanism. Records would slide off the turntable, and albums with new automatic sequencing were introduced with the prefix AM-, as for example AM-253. 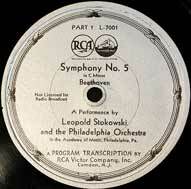 After playing sides 1 through 4, the listener would turn over the entire stack of records to continue playing sides 5 through 8. These albums used the prefix AM-. Again, after playing sides 1 through 4, the listener would turn over the entire stack to continue with sides 5 through 8. These albums used the prefix DM-. 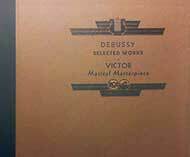 Not all Victor multiple disc albums were issued in all three formats, but collectors will frequently find one of these versions for sale. 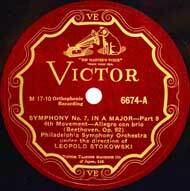 1 Harry O. Sooy In his memoires states: "...December 8th, 1924: After considerable work remodeling the 5th floor, Building #15, for an additional Recording Room for the Laboratory, we made our first records of the Philadelphia Orchestra in this studio on this date..." You can read of my analysis of where these recordings were made by clicking on Installation of Electrical Recording Equipment in Victor Building number 15, Camden . 2 page 102. Smith, William Ander. The Mystery of Leopold Stokowski Fairleigh Dickinson University Press. New Jersey 1990. 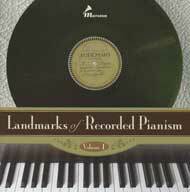 ISBN-13: 978-0838633625 I have been asked if others did not orchestrate the pieces such as the Frescobaldi or Palestrina. 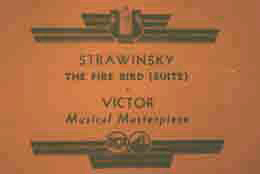 Smith identifies Stokowski as the orchestrator of these two pieces, confirmed by the Stokowski score collection. 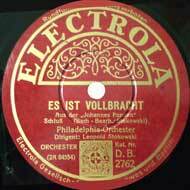 Some have suggested Fritz Stein (1879-1961), a musicologist, and colleague and biographer of Max Reger (1873-1916) who did orchestrate some baroque works, including Gabrieli"s Sonata pian e forte from the "Sacrae symphoniae", which Stokowski recorded. 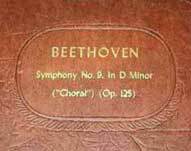 Fritz Stein was also the discoverer of the manuscript of the so-called "Jena Symphony", once thought to be a work by Beethoven. H. C. Robbins Landon later demonstrated that it was by Friedrich Witt (1770-1837). 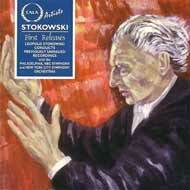 However, the Frescobaldi and Palestrina orchestrations were by Stokowski. 4 Kaplan, Richard. 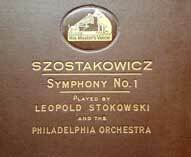 The Philadelphia Orchestra - An Annotated Discography. Rowman & Littlefield. London. 2015. 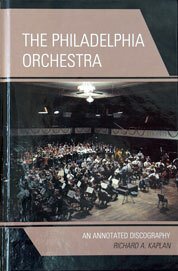 ISBN 978-1-4422-3915-9. 7 Storch, Laila. Marcel Tabuteau "How Do You Expect to Play the Oboe If You Can't Peel a Mushroom?". 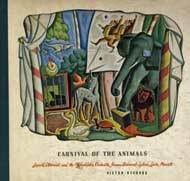 Indiana University Press. Bloomington, Indiana. 2008. 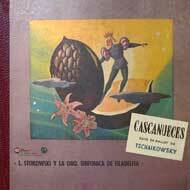 ISBN-13 978-0-253-34949-1. 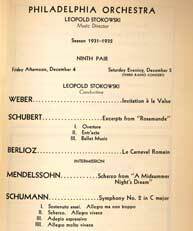 8 Page 12"Christ Cited by Stokowski in Defending Internationale". Detroit Free Press. Detroit, Michigan. 27 January 1934. 9 Page 290. Martland, Peter. 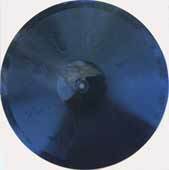 Recording History: The British Record Industry 1888-1931. Scarecrow Press. Rowman & Littlefield. Lanham, Maryland. 2012.